Geeks on Tour is member supported. This FREE newsletter is made possible by our paid (Premium) members. 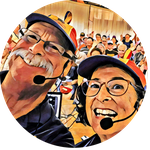 Member benefits include access to over 500 tutorial videos, asking questions on ‘Ask the Geeks’ forum, Show Notes for our weekly show, “What Does This Button Do?” and all our eBooks including Mrs Geek’s Guide to Google Photos. On November 1, we were home, but then Chris flew to California for the Google Product Experts Summit. She took advantage of the free flight from Google to take a few extra days and visit Morro Bay, and her old friend, Liz. 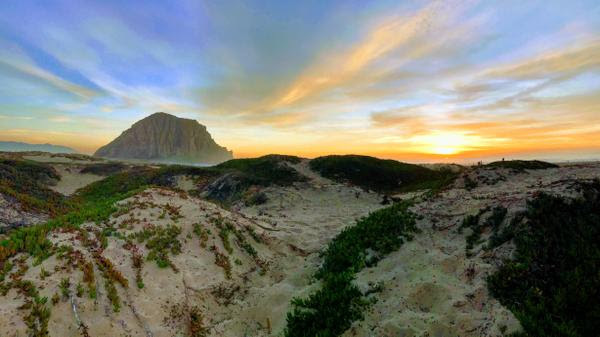 Chris lived in Morro Bay and practiced law with Liz in 1981-83. Check out our photo album photo album for November for more pics. We always continue to learn about technology! And, we share it with you on our weekly class, What Does This Button Do? We’re Still in South Florida. We are working on the website and videos. We have a couple of online seminars on the calendar but only one live appearance. Holidays are upon us. all of February. Stay tuned for photos! Like our Facebook Page for notifications to see us Live whenever we like. Both Waze and Google maps can give you turn-by-turn voice directed navigation. Waze also adds real-time crowdsourced road information including traffic, road hazards and police locations. I’ve had people tell me that they prefer Waze to Google Maps because Waze gives information about traffic. Hey! So does Google Maps. Have you ever wished you could make a photo of a flower, or a person, really stand out – with the main subject in color and the rest in black and white? It’s called Color Pop, and it is a new feature from our friends at Google Photos. It was announced along with Live Albums on Google’s product blog on October 9, 2018. At the time it was only available on the Pixel phone, but it has arrived on the iPhone now as well. You don’t want to miss a second of your granddaughter’s graduation ceremony, so you start the video camera rolling as she’s walking up to the stage. Now you wish you hadn’t done that! Nobody wants to watch the 3 minutes of her walking, they just want to see her step onto the stage and get her diploma. Learn how you can accomplish this, right on your phone, by reading this short article. With these smartphone/GPS devices in our pockets all the time, there are now many different ways to share your location. Apple has the “Find my friends” app, Facebook messenger (and many other texting apps) have a button to “Send Location.” If you’re like me and my husband, we like to make it easy and just let each other know where we are at all times. It’s easy with Google Maps. Maybe you’re a fulltime RVer with kids who worry about you a lot. Rather than calling them every day, you could let them see your position on a map that they could look at as often as they like. You should still call once in a while, OK?